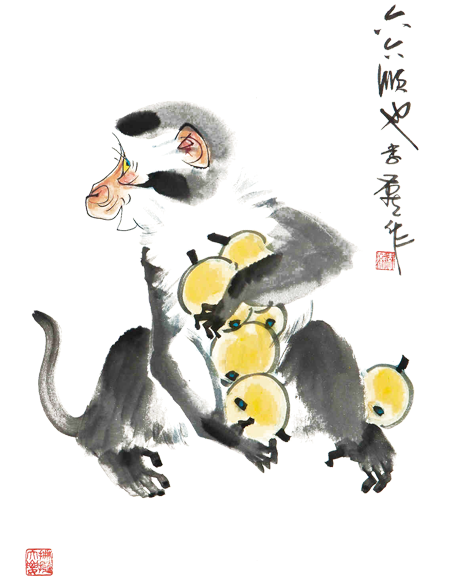 This simple and very charming monkey painting is by Chinese artist Li Yan (b. 1949). The original 46 x 66 cm artwork is available for auction. Visit the China Guardian and ArtNet websites to discover more beautiful works by Li Yan. So, today is the first day of the year according to the Chinese Lunar Calendar. But it's actually already the 5th day of the Red Monkey Year. Yeah, there's a difference hehe. Have you guys read about your fortune for 2016? Every year I read about mine at chineseastrologyonline.com by Master Tsai. Well am certainly glad to read about encouraging things about the year of the Fire Monkey for the Wood Rabbit (my sign), even if Monkey is not as an auspicious sign compared to Horse, Dragon, and Tiger. Last year my fortune in the year of the Goat was just meh-eh-eh. But this year they say it's gonna be a good one for me. Not excellent but good at least hehe. According to Chinese astrology, Rabbit and Monkey are compatible signs. Not just in love relationships but also in business relationships. The Rabbit's creativity in making products combined with Monkey's clever marketing skills make an awesome combo. Monkey makes Rabbit famous which brings money to both of them. Learning this, I now have a new motto: "Monkey business is bad but business with monkey is good." LOL Anyone out there born in the Monkey Year?! !